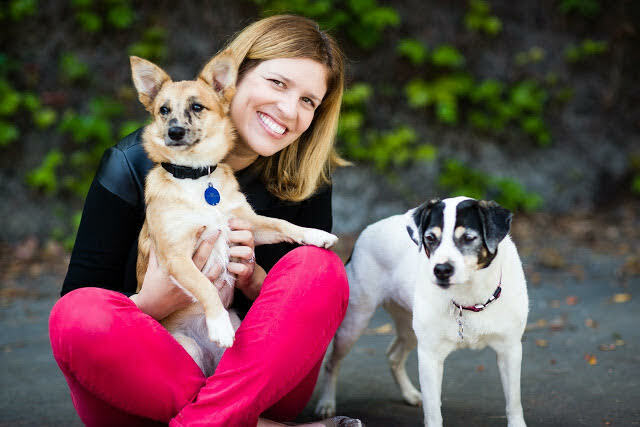 This is me, Jennifer Caloyeras, and my two rescue dogs, Dingo, 4 (the brown one) and Reba, 15! We actually had both our dogs genetically tested since we last spoke, so I can say, with more certainty that Dingo is part Australian Shepherd and part chihuahua and Reba, although she received every recessive gene possible, is a pit bull! I am a writer and I also teach writing at UCLA Extension's Writers’ Program. My third book was recently published. 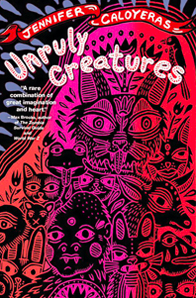 It’s called Unruly Creatures and it’s a short fiction collection full of wonderful weirdness. And lots of unruly creatures. I’ve been into the Stumptown coffee out of a french press. It says it has hints of citrus and chocolate. I don’t know about all that, but it does help me wake up in the morning! They are enjoying some hip and joint turkey jerky for dogs. It’s smells so good. I almost want to eat it. Readers can click back to your 2015 Q &A to learn how your dogs got their names, but I wonder: have Reba and Dingo acquired any new nicknames in the last couple of years? We call Reba sleeping beauty because she literally sleeps almost all day. Have any actual dogs inspired fictional dogs in your new story collection? There is one story in the collection, “Big Brother” that has a very loyal dog in it. I remember watching Reba napping and dreaming and using that to describe how this dog was dozing. Now that Reba is 15 years old, is she facing any special geriatric challenges? She really has slowed down a lot of the last few years, although, every once in a while she’ll bound across our yard with the energy of a puppy. (and then she follows it with a four-hour nap.) She suffers from some hip pain and the stairs are a bit more difficult to navigate. She’s on medicine for high liver enzymes. But other than that, she’s really doing pretty great! Where is your dogs' favorite outdoor destination? We recently took them to Three Rivers, California at the base of the Sequoia National Park. They loved it! There was a small creek for them to play in and so many new smells to smell. Coyotes definitely came out at night, so we were sure to keep them inside once the sun went down. When I last asked about your dogs' best pet-pals you mentioned guinea pigs and humans. Have Reba and Dingo met any special canine friends since then? Dingo especially loves a good dog playdate. She has some dog friends - Gryphon and Charlie, who come over to play with her. They have concocted all sorts of intricate games with their own set of rules. It’s very fascinating to watch. They’d want me home all the time. And in my bed, so they could snuggle with me. I think, I would like this too! When I last asked who should voice your dogs in a movie about your life, you mentioned Soleil Moon Frye for Dingo and Helen Mirren for Reba. Are there any new actors you'd consider for the job? I’m very pleased with my casting choices. Coffee with a Canine: Jennifer Caloyeras & Reba and Dingo (May 2015). Nice to meet you too, @Zooperson!